This article was first published in the Catholic Herald on 27 March 2015. The Sistine Chapel takes you by surprise. You turn into a narrow, nondescript doorway, and suddenly the world’s most famous fresco looms above you. Taken as a whole it is a breathtaking sight. For the individual scenes you wish you had binoculars. The world it depicts seems to be in 3D – male nudes sit on plinths in the foreground as the story of Genesis unfolds behind them. You stare, mouth open, neck craned, trying to fathom how it works. 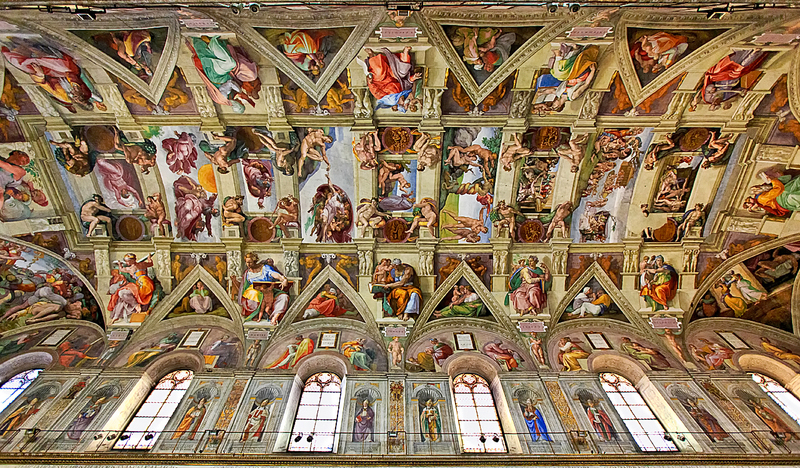 Michelangelo took four years to paint the ceiling and, once completed, it won instant renown. His biographer Giorgio Vasari wrote: “When the work was thrown open, the whole world could be heard running up to see it.” Artists such as Titian and Raphael immediately imitated the new style. Prints and drawings of the various scenes circulated in Europe. Two centuries later, Sir Joshua Reynolds, urging students to copy the fresco, called it the “language of the gods”. The Church proved harder to please. Pope Julius II, who commissioned the work, liked it, but nine years later Adrian VI threatened to have it chiselled off, saying it was more suited to a bath house than a church. Michelangelo’s second fresco, The Last Judgment, painted 25 years later on the altar wall, provoked more controversy. The chief objection was all the flesh on display: the figures being lifted up to heaven and dragged down to hell were mostly naked. During his lifetime, Michelangelo was eminent enough to have his way, but once he died the most explicit details were painted over with loincloths, breeches and bits of flowing drapery. Adrian VI, who reigned for only 18 months, has been much derided for his dislike of the fresco. But he had a point. Michelangelo was enraptured by the human body. Sensual, muscular figures dominate the chapel. No wonder they caused alarm among Vatican officials. Even today Catholics may wonder if they are not perhaps entirely suitable. Thanks to better arts education and cheaper travel, the popularity of the Sistine Chapel has continued to grow. Last year nearly six million tourists flocked to it – three times the number 30 years earlier. But the chapel is not just a place of secular pilgrimage. It is also the pope’s private chapel. It is where the pope is elected, where he celebrates his first Mass, and, in a tradition started by St Pope John Paul II, where he welcomes newborns into the Church through baptism every January. The chapel’s two roles – as a tourist spot and a sacred space for Mass – are in conflict. This is especially so when it comes to money. The chapel generates a lot of revenue for the Vatican. Technically, there is no entrance fee. Yet everyone who steps inside it has paid €16 (£12) to get into the Vatican Museums. And most of the tourists who pay that fee aren’t interested in the sculpture, the 16th-century maps or the porphyry (incredible though they are): they are there simply to see the Sistine Chapel. 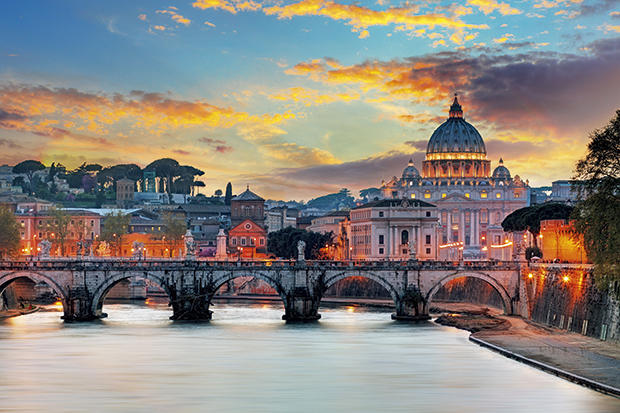 According to Fortune magazine, the Vatican Museums are the “only branch of the Vatican run like a true business”. They generate £88 million a year. Fortune’s Shawn Tully claims that, along with the Vatican Bank, the museums have been identified as an area for future financial growth, with the Vatican’s financial tsar Cardinal George Pell hoping to increase revenue through marketing and exhibitions. In response Antonio Paolucci, the director of the museums, accused Citati of being elitist. “The days when only Russian grand dukes and English lords or Bernard Berenson [an American art expert] could gain access to the great masterpieces are definitely over,” he wrote. “Limiting numbers is unthinkable.” Such a sentiment is laudable. But it seems highly convenient, too, given that wider access comes with much greater revenue. Last autumn Paolucci finally relented, saying visitor numbers would be limited to the current annual figure of six million. That will not fix the problem. He must go further: a timed entry system and evening opening hours would be a start. In London, where museums and galleries are under pressure to innovate due to shrinking state funding, this is now commonplace. The Sistine Chapel’s other problems can be solved at a single stroke: by ending its use as a sacred place. That way the chapel can be admired by the world’s art lovers and shore up Vatican finances without causing any scandal. The process would be simple: the pope would issue a decree recognising the church’s new status and the Masses celebrated there would be moved elsewhere. For conclaves there would be no shortage of other venues. If Michelangelo frescoes are a requirement, the elections could take place in the splendid Pauline Chapel, which is slightly older than the Sistine Chapel and just across the hall. The change may bring relief to papal masters of ceremonies. One contemporary critic of Michelangelo was the pope’s MC, Biagio da Cesena, who thought the nakedness of the figures in The Last Judgment was shameful. In revenge, Michelangelo painted his likeness into the features of Minos, a goat-eared demon. An end to Masses in the chapel would mean future MCs no longer having a predecessor staring out at them from hell. Right now the Vatican Museums hardly seem poised for dramatic change. Paolucci, the director, and Mgr Paolo Nicolini, the administrative head, have been in their posts since the early days of Benedict XVI’s pontificate. Pope Francis’s attention is elsewhere. 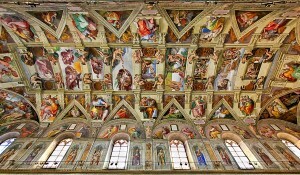 But the Sistine Chapel is one of the only points of contact many people around the world have with the Catholic Church. Francis is trying to reform Vatican finances because he sees the Church’s credibility being damaged by it. The present state of the Sistine Chapel is having the same effect – if only he could reform that too.